Practical SQL Server tuning written in a format that you dont have to be a tuning expert to understand. Chances are you have extra information in the buffer pool for a bad query and it’s dragging down your PLE, causing SQL Server to run slower because it’s reading more from disk. Although this approach is taking a 180 from my post Fixing Page Life Expectancy it has the same effect, with that post focusing on fixing your worst queries and this one focused on fixing your most misused indexes. One approach doesn’t replace the other, it’s more like burning the candle at both ends, except that you end up with a better running database instead of getting burnt out. With this approach we start with what’s in the cache. You’ll see the same types of issues in almost any database, and this just happens to be a production database I’m going through today. 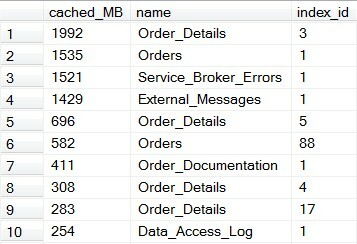 First, there is an errors table here with Service_Broker_Errors, and that should never be in the top 10. What are we doing wrong? The index ID of 1 tells me right away that this is a clustered index, the fact that the table is at least 1.5 GB tells me that we’re probably not purging old data, and 1.5 GB in memory on this table is hinting that we’re probably doing a clustered index scan. I’ll start by looking at the proc cache to see what’s going on. There’s only one execution plan that used that index and it is, in fact, doing a clustered index scan as I expected. In an execution plan you’ll have a seek predicate and just a plain old predicate. The seek predicate is what you were able to do taking advantage of the index being in order, and the predicate is what you had to scan for. Now this sounds like a reasonable query looking for errors. I’m looking for the errors that occurred in the last so many days. The CONVERT_IMPLICIT(datetime,[@1],0) shows me that someone typed this the lazy way of GetDate()-1, which isn’t as efficient as DateAdd(Day, -1, GetDate()), but you’re getting me off topic again. Looking at the indexes on this table I realize there is only one, and it has the single key column of ID. For uniqueness you can’t do much better than an ID column, but you have to ask yourself if you’ll ever use it to query by. In this case the index has never had a seek against it, only scans. Although there table is rarely queried with only 4 uses in the last 2 months (I limited my historical data for this query), it’s still pulling 1.5 GB into cache for every use. After a couple seconds of shaking my head I start to create a change request to make add TimeStamp in as the first key column in the clustered index. However, I then remembered that this table is 1.5 GB. Is that right? It’s an error table, so if it’s really 1.5 GB then I should either be cleaning up old data or there are so many problems that there is no reason I should be spending my time tuning. Seeing that it has 0 updates in the last 2 months, I already know it’s old data. To double-check on this I run a simple query, keeping in mind the ID is still the clustered index, to find the oldest record, and discover that we haven’t removed anything from this table in years. The reason I did it like this is because I don’t want to fool around with the junk values as I drop the clustered index (rebuilding the table) then recreate the clustered index (rebuilding the table) with all of that information in there, then delete it all and wreak havoc on the new index. Sure, the fragmentation at the page level would be fine since I’m deleting in order, but that’s a lot of changes to the b-tree. I know, I just got done saying that GetDate()-90 was less efficient than DateAdd(Day, -90, GetDate()), but it’s an implicit conversion that’s done once per call. I admit this is a bad habit of mine, and any time there’s even a chance of this being called once per row I have to write it differently than I normally do. Nobody’s perfect, and the most important thing is that I’m getting rid of all those records using batches, right? Now that all of this is done I took a 1.5 GB table with all of it in cache to a 20 MB table with only 1 MB in cache. Cleaning up the data had more of an impact that my index change, but it’s usually not that easy to clean stuff up. Even if I wasn’t able to clean up the data, the index change alone would have allowed for the cache usage to be decreased by at least 1.4 GB. That’s not the only issue I’m seeing here, in fact I bet I could take half of these off the top 10 list. However, today I’m picking up low-hanging fruit and moving on to the next task on my list. In this case, External_Messages is the next one that doesn’t look right to me. Once again, it’s a clustered index (index_id = 1) of a table that isn’t part of the primary focus of the database, which is handling orders. Starting with the same steps I look in the proc cache to see what put this here. Once again I see a single query in cache referencing the table, but this one is different. It’s the typical IF X = @X or @X IS NULL that we’ve all written, and it’s being used as the predicate. I check the indexes on the table and it has the ID as the only key column of the clustered index, so that’s not an issue. Why isn’t it able to use the clustered index with a seek predicate? After all, I’m rather certain that they almost always, if not always, call this with a parameter where it should be filtered down. Lets look at the execution plan to make sure. The sniffed parameter value from the first time it was called, as found at the bottom of that statement in the XML version of the execution plan, is, in fact, a non-null value. However, SQL Server can’t guarantee that you’re going to pass it a non-null value, and it has to make an execution plan that can account for either possibility. I’ve seen this before, so I know the basic options for a single optional parameter (there are more options, with increasing complexity). I can either add OPTION (RECOMPILE) to the query or I can rewrite it to be two separate queries. Here’s the option I didn’t choose. This will recompile the statement every run, which isn’t too much of a problem because it’s a quick compile on something that only runs a couple times a day. However, it will make it so this doesn’t show up in the proc cache anymore, which I take advantage of quite a bit (for instance, look at the blog post you’re currently reading). Also, it goes against my rule of using hints as a last resort. That’s not saying you can’t do it this way, just that I didn’t. The reason it works is because SQL Server knows when it makes this execution plan that it will only be used once, so it doesn’t have to account for the possibility of it being a NULL value next run. In fact, it just makes the execution plan with your parameter as a constant value. Here’s the method I decided to go with. Assuming third-normal form doesn’t apply to query text, you should be good to go here. If it’s simple enough then it will be very obvious to anyone editing this at a later point that they need to make any changes in two places. This solution isn’t too complex with just a single parameter as it only creates two queries, but if you get just three parameters and try to do this then you’re up to 8 queries. The OPTION (RECOMPILE) method starts to look pretty good as a quick and easy fix before too long. I would still prefer one of the long and drawn out methods, such as getting interim results to a temp table, making it look a little more complex, but getting it to run efficiently with a cached plan. It worked as I expected, with no one actually getting all of the IDs. I left the code in place to make it possible to get all of them to avoid digging through all of the application code to find where it could return everything then make sure it gets changed there. The result I was looking for was cleaning up the cache, which I got when this dropped from 1.4 GB down to 25 MB in cache. Overall I was able to drop about 3 GB out of cache, making room for other data while raising the PLE, in two simple changes that were rather easy to track down just by saying “that doesn’t look like it belongs here”. Even the ones that do look like they belong there probably don’t need to have that large of a presence in the cache. Although I didn’t actually measure the impact that it would have on the end users in these cases because I didn’t start with a performance complaint, I would imagine that SQL Server tends to run faster returning processing 1 row it found quickly instead of reading through a couple million. So, measured or not, I’ll count that as a success as well. My queries looking into the proc cache are slightly modified versions of Jonathan’s work on his blog. Honestly, it didn’t need tweaked or touched for any reason other than the fact that I learn by tinkering. I did help myself by adding in filtering by database because I have a couple servers that have multiple copies of the same database, but, again, it worked great before I touched it, which is something you should expect from Jonathan’s work. DBAs rarely use the full potential of sys.dm_exec_query_stats. It’s common to see the queries for looking at the most expensive queries according to any of the stats contained within the current cache, which is great to see. However, if you grab snapshots of this information the proper way then you can get more detail that will really make a difference in your job. Capturing this every 4 hours is probably enough, and here’s what it’s going to do for you. First, using it the way most DBAs do and look at the most expensive queries according to a specific metric. It works the same for them all, so we’ll just say we’re interested in physical reads in this case because our PLE isn’t what we’re hoping it could be. You’ve probably seen the queries that directly query sys.dm_exec_query_stats to give you this similar to the one on MSDN for this DMV. That will give you everything that’s in the cache right now, which could contain queries that recompile every hour in combination with other queries that have remained in the cache since the server was rebooted two weeks ago. This means that when you’re querying to see what you can do to improve your PLE during business hours you’re getting anything that happens to be there now, not what ran in the time window you’re looking to improve. Now look at it from the point of view that you capture this information every 4 hours. You can get the total number of physical reads grouped by sql_handle where the interval_end time is in the last month, on weekdays, between 9:00 AM and 5:00 PM. This is both a more complete and more accurate picture of what you care about, and you’re more likely to be focusing on the queries you should be tuning from the start. Once you do start tuning, you want to know what effect you really had, and not just rely on the couple sets of test parameters you used in your NonProd environments. A couple days after your changes made it to production, it’s a good idea to make sure you had the desired effect. Query the data you have saved off for the last three days and for the same days last week. What I went over so far is just realizing how this takes the traditional use of this to a new level, but there’s more functionality here now that it’s being saved off. Now this is extremely useful in incident response. Before you could see if anything was hogging resources as seen in my Recently Recompiled Resource Hogs post, but now you take it a step further by being able to verify if what’s running long now has always run that way or if something is different. Also, with having the plan_handles saved off you can even see if it’s getting a different execution plan, which will help you determine if this was a change in data or if it’s a bad execution plan. Not to shoot myself in the foot, but this isn’t perfect. If you capture this data every 4 hours starting at 12:00 and it recompiles at 3:59 then you’ll only capture one minute for that interval. Also, if you’re dealing with a query that can’t be cached then it won’t be found here at all; this is why you’re also running traces to find the big queries and watching sys.dm_os_performance_counters to know when there are a lot of compiles and recompiles. To start capturing this, here are the tables you’ll need to capture everything. --Wide is bad, if you have a lot of nonclustered indexes. --This is a high-writes, low-reads table, so a single clustered index is probably all I want. -- as well as bad write performance. Now that the tables are created, here’s how I populate them. Set this up to run once every 4 hours to keep the data small during typical running, and kick it up to once an hour or more if needed to pinpoint an issue if you need it. --This sounded like a great idea, but it just slowed it down several seconds.